Meet meow the fattest cat on earth today, this 2 years old cat weighing about 2st 9lb or approximately 18kg which is four times the weight of a normal cat. Due to his weight now meow have to put on a diet to reduce his weight. 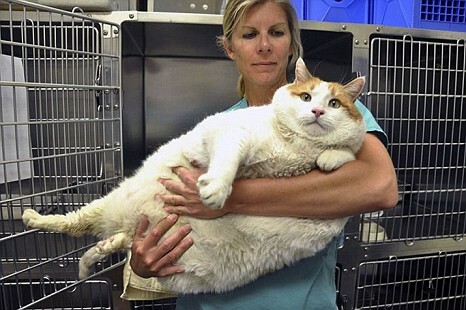 Now he is too big to be taken care of by his 87-year-old owners, vets have taken over and put Meow on a diet. They say he weighs the equivalent of a 273kg (43st) human and displays ‘all the health risks that you would see in a morbidly obese person’. Before meow the records of the World's fattest cat was held by Himmy an Australian cat which weighing about 21,3kg(3st 4lb). but after himmy died there's no current title holder for the records. It seems that meow will held the records of Guinness World's fattest cat today.